First, let’s focus on Powell’s comments. Then we’ll explain what they actually meant. The Fed has taken a March rate hike off the table until further notice. At a forum in Atlanta two Fridays ago, Powell joined former Fed chairs Yellen and Bernanke to discuss monetary policy. In the course of his remarks, Powell used the word “patient” to describe the Fed’s approach to the next interest rate hike. When Powell did this, he was reading from a script of prepared remarks in what was otherwise billed as a “roundtable discussion.” This is a sign that Powell was being extremely careful to get his words exactly right. 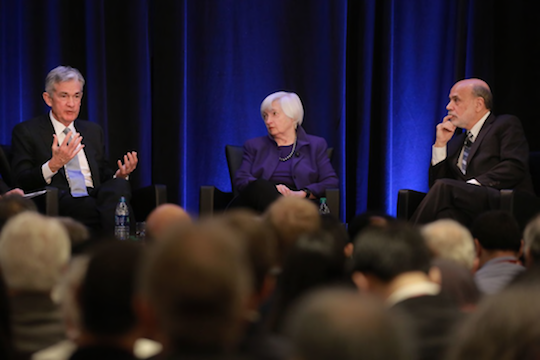 Fed Chairman Jay Powell (left) joined former Fed chairs Janet Yellen and Ben Bernanke at a roundtable in Atlanta recently. Powell revived the word “patient,” which was last used by the Fed in December 2014. It’s a powerful signal of no rate hikes until further notice. When Powell said the Fed would be “patient” in reference to the next rate hike, this was not just happy talk. 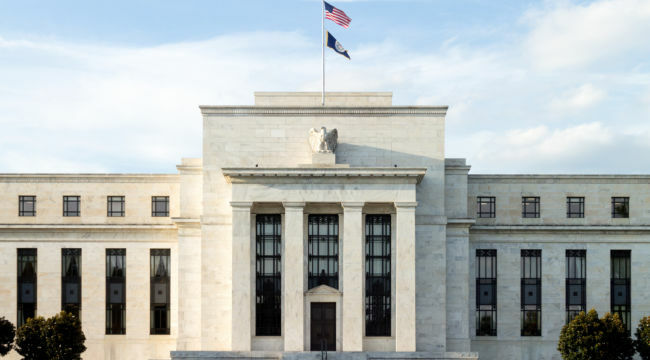 The word “patient” is Fed code for “No rate hikes until we give you a clear signal.” This interpretation is backed up by the Fed’s past use of verbal cues to signal ease or tightening in lieu of actual rate hikes or cuts. The word “patient” has a long history in the Fed’s vocabulary. Prior to March 2015, the Fed consistently used the word “patient” in their FOMC statements. This was a signal that there would not be a rate hike at the next FOMC meeting. Investors could do carry trades safely. As long as the word “patient” was in the Fed’s statements, investors knew that there would be no rate hike without warning. It was like an “all clear” signal for leveraged carry trades and risk-on investments. Only when the word “patient” was removed was the Fed signaling that rate hikes were back on the table. In that event, investors were being given fair warning to unwind carry trades and move to risk-off positions. In March 2015, Yellen removed the word “patient” from the statement. That was a signal that a rate hike could happen at any time and the market was on notice. If you had a carry trade on and were relying on no rate hike, then shame on you. Now, for the first time since 2015, the word “patient” is back in the Fed’s statements. This means no future Fed rate hikes without fair warning. This could change again based on new data and new statements, but a change is unlikely before March at the earliest. For now, the Fed is rescuing markets with a risk-on signal. That’s why the market rallied that Friday and has reversed December’s downward trend. But we’re not out of the woods. Just because the Fed signaled they will not raise rates in March does not mean that all is well with markets. The U.S. stock market had already anticipated the Fed would not raise rates in March. The statement by Powell confirms that, but this verbal ease is already priced in. As usual, the markets will want some ice cream to go with the big piece of cake they just got from Powell. On the one hand, if we’re at or near the start of a bear market it will take more than a Fed pause to offset that. On the other hand, there’s no reason for markets to crash based on the U.S. economy alone since the Fed may make more candy available by continuing to use the word “patient” in March. So we’re in wait-and-see mode. Meanwhile, there’s an even bigger threat on the horizon — China. Unobserved by many analysts, the Chinese are reducing their money supply even faster than the Fed. The Fed’s signal on rates says nothing about Fed reductions in the money supply under the quantitative tightening (QT) program. The U.S. money supply reductions are going ahead at $600 billion per year. China is burning money even faster to prop up the yuan in the midst of a trade war with Trump. What does it mean when the world’s two largest economies, comprising 40% of global GDP, both hit the brakes on money supply? Nothing good. Milton Friedman demonstrated that monetary policy operates with a lag of 12–18 months. These U.S. and Chinese monetary tightening policies started just over a year ago. The initial impact of what has already been done by the central banks is just being felt now. This means that the U.S.-China tightening will continue to be felt over the next year regardless of what the Fed does in March. Stopping rate hikes now is like hitting the car brakes when you’re driving on a frozen lake. You’re going to slide a long time before the car comes to a halt. Let’s hope you don’t hit a soft spot before then or you’ll end up underwater. The risk to investors is that markets are on a sugar high because of Powell’s recent comments. But the sugar will soon wear off and the Fed won’t provide more until March at the earliest. By then, the reality of slower growth in China and the U.S. and a lack of substantive progress in the trade wars will give the market a dose of reality like getting hit with a cold bucket of water in the face. What are the implications for investors of belated Fed ease combined with signs of weaker growth in China and the U.S.? Right now, my models are saying that Powell’s verbal ease is too little too late. Damage to U.S. growth prospects has already been done by the Fed’s tightening since December 2016 and the Fed’s QT policy that started in October 2017. The U.S., China and Europe are all slowing at the same time. Markets see this (despite Fed ease) and are preparing for a recession at best and a possible market crash at worst. One potential catalyst is the start of the Chinese New Year celebration of the Year of the Pig. Kicking off with the Little New Year on Jan. 28, this celebration actually stretches over two weeks and is accompanied by reduced productivity and liquidity in Chinese markets. That’s a recipe for volatility. We also have a Fed FOMC meeting on Jan. 30. No rate hike is expected, obviously, but there will be a written statement issued. Markets will be looking for the word “patient” in print, and if they don’t find it, there could be a violent reversal in the sugar high that started two Fridays ago.